The Paige KP-6E Acoustic Capo is sleekly designed, controlled tension capo for 6-string guitar. 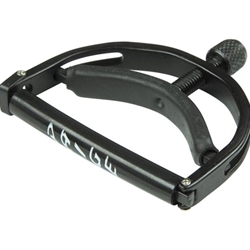 The Paige 6-String Guitar Capo is used by world-class studio musicians and award-winning guitarists. The Paige capo is ultrathin to complement the instrument and moves quickly and easily. Simply apply the minimum pressure needed until the strings voice clearly, and the controlled tension ensures there's no buzz or string muting. Store it behind the nut when not in use to save time. Max. width: 2-1/16", closed depth: 3/4", open depth: 1-1/8". Made in the USA.